South Meadow Ventures, LLC was officially formed in 2017 as parent company of Nova Natural Toys & Crafts, Isabella, Chinaberry, and Babylonia USA. With its formation, I was asked to create a brand identity for the company that would give it a unique identity separate from its child companies which had been its face years, while still tying into the companies it represented. 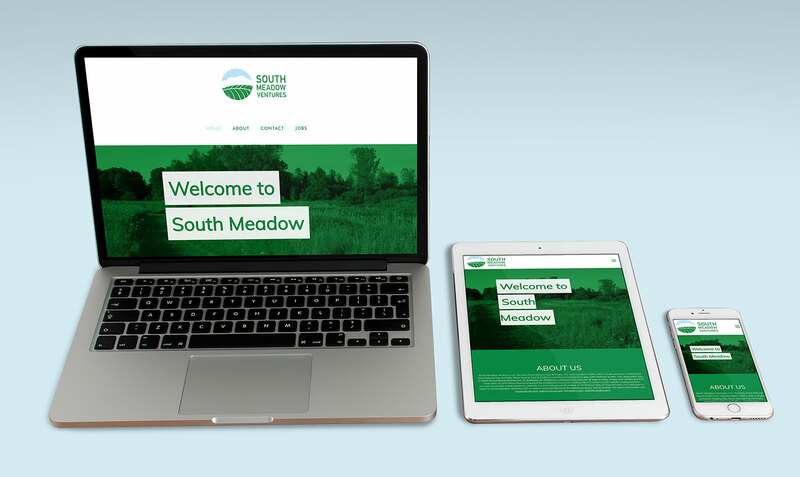 In the first steps of this project, I met with the owners of the company, three individuals, and discussed what values they saw South Meadow Ventures representing, what they wanted its identity to say, and what they considered the most important points of representation for South Meadow Ventures. I was given a variety of answers, each with a slightly different perspective on how the brand should look and feel, what values it should portray, but with the agreement that it needed to be rooted in small, local Vermont. I worked initially to compile these varying values and directions: It should be corporate, it should be rustic, it should be modern, it should be clean and professional, it should speak to small-town Vermont. I tried not discount one's values over another's—as the founders and owners of South Meadow Ventures each had a valid perspective and represented a different part of the company that was, at in these people, all of these things—and set to iterations of logos that would encompass these varying values. I tried a series of logo directions, focusing on blending styles based on the perspectives I had received, trying logos focused at each, and then abstracting as far as I could off all three value sets. 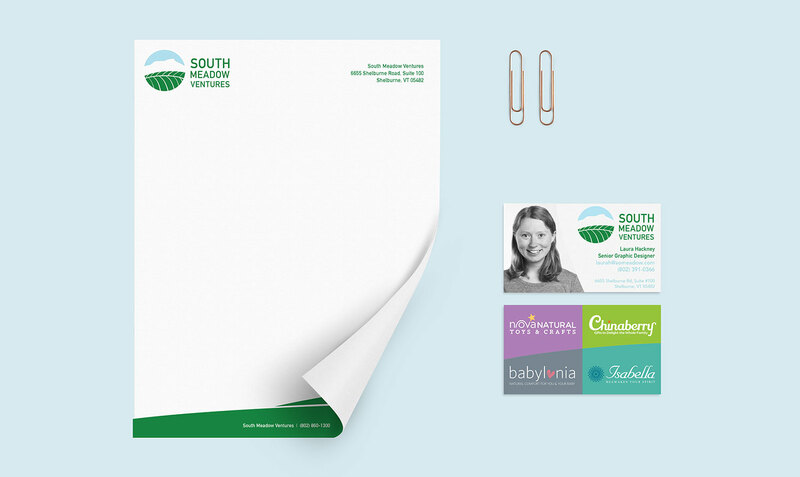 I looked for the middle ground, something that would be clean, modern, and look at home on a business card or corporate letterhead. The final logo was a mix of clean lines and refined colors, meant to invoke both the vibrancy and locality of Vermont, as well as invoke the importance of natural products and the small-town start of South Meadow Ventures to its growth as a parent company in the today, and iconography indicative of both Vermont and rural origins; Camel's Hump, an iconic mountain in Northwestern Vermont that dominates the horizon from the South Meadow Venture's offices and homes. Overlapping hills that invoke the hills of the meadow for which the company is named and the veins of a leaf, once again harkening to rural roots and organic focus.